Hung Nguyen-Viet, a senior scientist in food safety and ecohealth at the International Livestock Research Institute (ILRI), was named the winner of the 2016 International Association for Ecology and Health (IAEH) Exceptional Early Career Contribution to the Field of EcoHealth Award together with Jonathan Kingsley of the University of Melbourne. 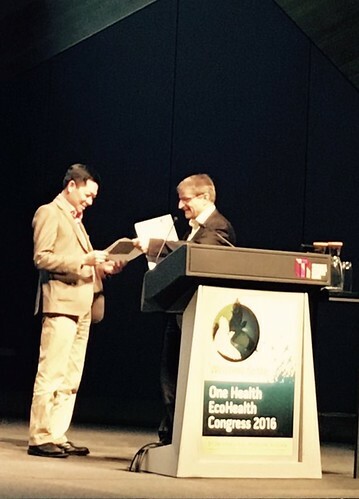 Hung Nguyen-Viet (left) receives the 2016 International Association for Ecology and Health (IEAH) ‘Exceptional Early Career Contribution to the Field of EcoHealth’ award from former IEAH president Jakob Zinsstag (photo credit: ILRI/Tarni Cooper). IAEH is a scholarly organization whose membership is drawn from all continents. Its mission is to strive for sustainable health of people, wildlife and ecosystems by promoting discovery, understanding and transdisciplinarity.